All my life, today has been a special day. Not just because it is the eve of Christmas Eve. It was the first family Christmas party, at my paternal grandparents' house, it was my mom and dad's wedding anniversary, but most importantly, it was my mama's birthday! Today, things are quite a bit different, of course, I will not be going to my grandparents house like we did my entire childhood, nor will I sing happy birthday to my mom and present her with a gift that I tried to wrap in order for her not to guess it first. She would have been 78 years old today. In 2000 we celebrated my parents 50th anniversary but in less than two years my mom would be gone and my dad was too, just over a year later. We refer to it as his "bonus year", since the doctor didn't expect it at all. He went into the hospital for the final time on the 23rd. The great thing is their oldest granddaughter's first son was born on the 23rd four years ago today. He was due on the 19th, as soon as we heard that, she and I both wondered if it would be possible. As Christmas drew nearer, her doctor wanted to schedule the delivery, naturally, she chose the 23rd. She prepared to check in the hospital the night before....and did, but she was never induced. She went into labor naturally that evening. So, little Finn came just when he was supposed to, on his great grandmother's birthday, just according to plan! It will always be a special day for sure. 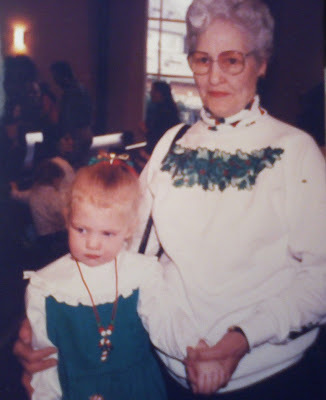 The photo is mom with my daughter just after VolleyGirl's tearful pre-school Christmas program, at least 13 years ago. To be half the mother, I would be greatful. this is a truly wonderful tribute. you were blessed to have them with you for so long. have a blessed xmas and a happy new year. hugs.